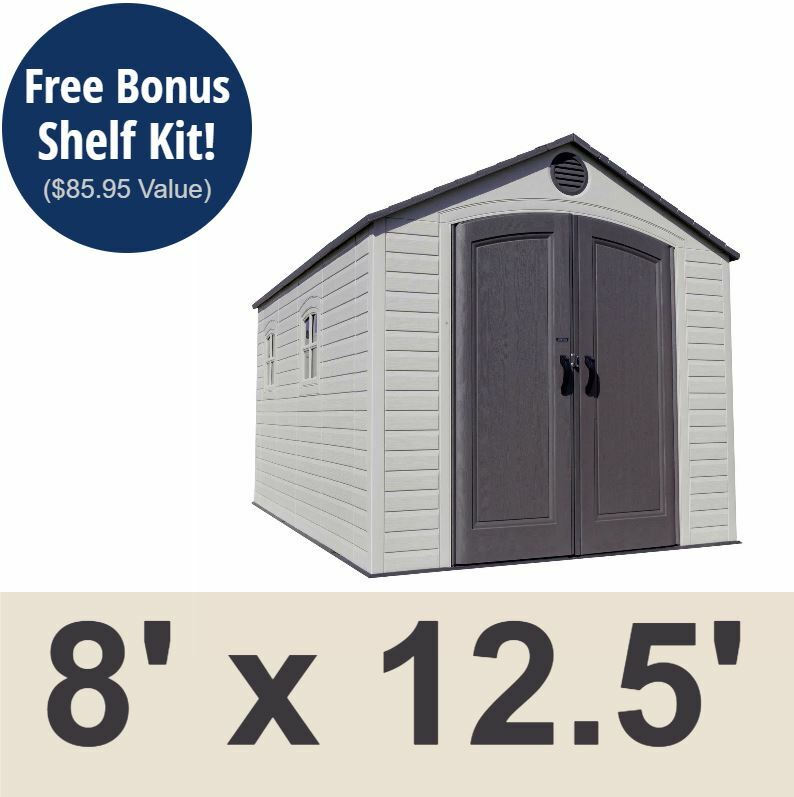 Lifetime 6402 Storage Shed 8x12.5 on Sale with Fast and Free Shipping. 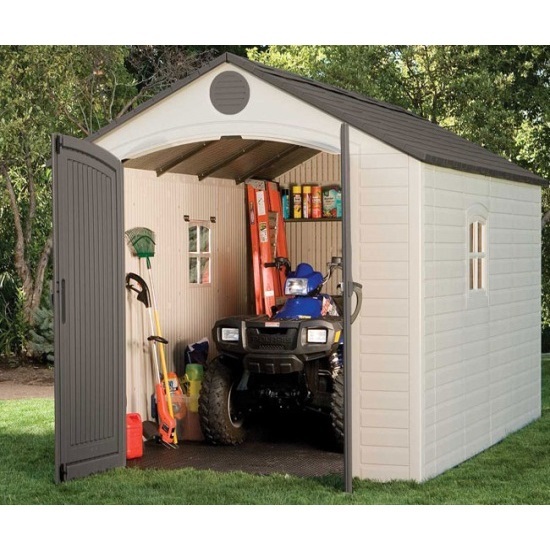 Competitive Edge Products, Inc. is an authorized distributor of the Lifetime 6402 8 x12.5 ft Outdoor Storage Shed. I just built the Lifetime Shed with Extension kit. I am so far very pleased with the shed. It seems very sturdy and in fact the first night it was built we had a major wind and rain storm and it had no leaks or damage. I am impressed with the craftsmanship and quality of the materials. It is a nice looking shed and has a lot of usable space. It comes with the shelving kit which is actually very usable. I ordered the newest extension kit which had the bigger skylight. The extension kit made a big difference in the amount of space added. The skylight allows as much space as a window. Like other reviewers have stated you need to have a level base prior to install. This will make the install go much quicker. There are shims to add in leveling so do not stress if you need to use one or two. Two people are not a must but sure makes it a lot easier especially on the roof and snapping the walls in place. It took me roughly 6-8 hours. Overall very impressed so far and glad I order the extension kit. It is also a bonus you can add at least one more extension kit if you want/need at anytime. Very versatile. Would definitely buy again and I got fast friendly service from Competitive Edge at the best price. No damaged parts on delivery so a win win. I just installed the Lifetime 6400 shed,Let me tell you what a good quality shed ,I had the rubber made shed before this and thought that was good but seeing this one blew it away. I installed over a sand base which made it difficult to snap walls to floor but if your planning a hard surface install this should make it easier. We had 3 people for install which helped since there was a slight breeze and 30 degrees out. Instructions where a little challenging but the shed is up so I guess it was not that bad. You will enjoy this investment. Had it in a weeks time no tax and no shipping. Pros:"NEIGHBORS LOVED IT","EXTREMELY EASY TO BUILD","Very sturdy","LOOKS SO NICE" Cons:"none" Best Uses:"LAWN EQUIPMENT","POND SUPPLIES" Bottom Line:Yes, I would recommend this to a friend. I AM EXTREMELY PLEASED WITH THIS PRODUCT. I HAVE SHOWN MANY PEOPLE THE AFTER BUILT PICTURES AND THEY SAY ITS BEAUTIFUL. I WILL BE BUYING ANOTHER SHED FROM THIS COMPANY IN THE FUTURE FOR ANOTHER LOCATION. THE ONLY THING I COULD ASK FOR IS THAT THIS SHED CAME WITH ALL THE ACCESSORIES INCLUDED... I WOULD LOVE TO ATTACH THE ACCESSORIES AND MAKE IT LOOK PERFECT. AFTER BUILDING THIS SHED I FELT SO PROUD. THANKS LIFETIME YOU HAVE A GREAT PRODUCT AND PEOPLE SHOULD KNOW IT. Bottom Line:Yes, I would recommend this to a friend. I bought this shed in August, 2005. The assembly was easy with the help of a friend. I have a self standing workbench, 10 inch table saw, drill press, free standing shelves and storage cabinets and still have plenty of room to walk around. We have some extreme high temperatures here in the summer. About two years ago the skylight seams opened allowing water to leak in. Replacements were [...] and installed easily. Recently I noticed that the corners had separated allowing me to see daylight through all four. An e-mail resulted in four aluminum angle pieces that snap in place on the exterior and seal the corners. This company stands behind their product with a ten year warranty. [...] My friend who helped me install it has since purchased one and is also very satisfied. Pros:"Useful","Sturdy","Easy assembly" Cons:"Hard to make level base","Corner tears" Bottom Line:Yes, I would recommend this to a friend. We've had this shed for about 7 years and it's made three military moves, withstood Santa Ana winds, snow storms, rain and much more. It's been great and well worth the money. The only problems were getting a completely level surface to assemble it, and the corner pieces have started to tear after repeated disassembly and reassembly. Have to say it's been great, though. To start off we just built this shed on June 3, 2012. So not much usage yet. Instructions left a lot to be desired. But once you figured them out it was quite simple to install. We used a power drill with an adjustable clutch on low setting and it went together pretty fast. I installed it on an already existing concrete pad. Anchored it to the concrete like the instructions suggested. I can see the corners being a little weak in the long run. Very appealing. I had a total of 3-4 people helping build the shed. My buddy said as soon as his house is built he is buying one like it but bigger. Neighbors have expressed interest in one too. Wish it had more standard accessories that came with it. But will be ordering them here soon. Pros: "Easy to build" Cons: "Needs more accessories" Best Uses: "Storing Lawnmower", "Storing tools" Bottom Line: Yes, I would recommend this to a friend. This is a excellent storage shed. Directions were easy to read making installation simple. Did most of the work myself. 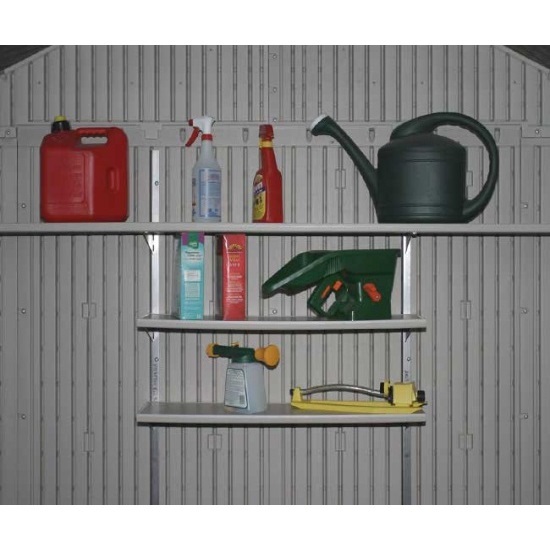 I like the fact that you can add on to the shed to increase storage. Bought an extension to increase shed to 15 ft. Very happy with the results. Would buy again for future use. Q: I want to order this shed but I need to know if the boxes they are shipped in will fit in my pick up truck I have an 8 foot? A: Shed model 6402 comes into boxes weighing a total of 598 pounds. Box number one is labeled 64020, 316 pounds, 96 x 32 x 14. Box number two is labeled 64021 and weighs 223 pounds, 75 x 32 x 14. Q: Is this shed completely sealed and rain proof? Are there any areas or cracks that rain can get in? A: These are considered water-tight, but as with any of our sheds - severe horizontal rain could get a few drops in through tiny openings such as the bottom of the door if it pools enough. That's the case with any brand we carry. Feel free to contact us with any other questions. A: The shed colors are very interesting. The official colors are desert tan for the walls. The roof and doors are considered Brown. However, it's very interesting to me. It's like purchasing paint. It looks one color at a certain time of day with a certified lighting on it and looks a different color in an overcast or towards the evening. The shed is the same way. I have a neighbor who has this model and it clearly looks desert tan and brown when the sun is shining on it. With an overcast at slightly different. During an overcast I would say that everything becomes more earth to and that the doors in the roof look more gray than they do brown. For your convenience on most of our shed listings we put a piece of white paper on the storage shed and took a photograph so you can see how it compares. You may not see that exact photo on this particular lifetime shed. But if you look at the other lifetime sheds you should see a photo of a white piece of paper. The lifetime sheds are all the same color with very few exceptions. Those exceptions we do make clear what those colors are. If you have any other questions let us know. We are happy to help. Q: HOW DO THESE HOLD UP TO HAILS STORMS? WE HAD GOLF BALL SIZE LAST SPRING, JUST WONDERED IF THE PLASTIC WOULD HOLD UP, ESPECIALLY AS THE PLASTIC GOT OLDER. A: The plastic material very well. It has UV protectant's so the sun is not an issue; however, that size of hail could probably damage any of the sheds we sell including the wooden sheds. Fortunately, should there be an issue a keep replacement parts for the sheds for up to 10 years from the time the product is discontinued. Feel free to contact us with any other questions. Q: Can I get this model with a side entry as well? A: Model 60079 is a dual entry model where the doors on the 15 foot and 8' side. Is that what you're looking for? Q: I have a golf cart will it fit in doors.? A: That depends on the size of the golf cart, but I would still recommend a larger shed. Q: What is the difference between 8x12.5 models 6402 and 60035 besides price? A: Model 60035 was actually discontinued a while ago. Sorry for the confusion. Feel free to contact us with any other questions. Q: Do u happen to have the product ID # on the shed? A: The Model number/SKU on this shed is 6402. The UPC is 081483064024. Q: Do you deliver to Niagara Falls, Canada? A: We do deliver to Canada. To determine the shipping to Canada simply add the item to your cart and it will ask you for your post code. Feel free to contact us with any other questions. Q: We had an unusual amount of snow here this winter. How many inches of now can this shed handle? A: The maximum roof load capacity is 23 pounds per square foot. On average a cubic foot of snow weighs 15 pounds, but if compacted it can weigh 20 pounds or more. If you usually get more than a foot of snow, you may want to get a shed with a specially designed snow load kit. Q: How well will the floor hold up against heavy weight? A: The Floor is made of High Density Polyethylene, which will not crack, chip, or peel. The floor will hold plenty of weight as long as you have a solid foundation beneath it. Q: Do you have a prebuilt ramp that I could buy or would I need to make one? A: We don't have a pre-made ramp for sheds, you would need to make one yourself. Q: Where do I put bolts through the floor to attach it to the foundation? A: The shed is designed with a slight indentation in each corner of the floor so that you can drill through the flooring to secure it to the foundation. Q: Is this seal proof I have a lot of chipmunks? Does it come with flooring? Is it easy to build? A: Chipmunks should not be able to get in when it is closed, as long as you build it correctly. The floor is included, and assembly is much easier than building your own shed. If you would like assembly assistance, then please call 855-544-8854, and give them the model number of the product, and your zip code. Q: Could I get more doors to put on the back of the shed? A: Please call 855-544-8854 and give them you zip code and the model number of the product, for an assembly quote. Q: Does this shed support a heavy storm? A: This shed will hold 23 pounds-per-square foot, however if you would like a higher snow rating, then we have the 60011 which will increase your weather and snow capacity. Q: What color is it? Looking for light gray with black roof? 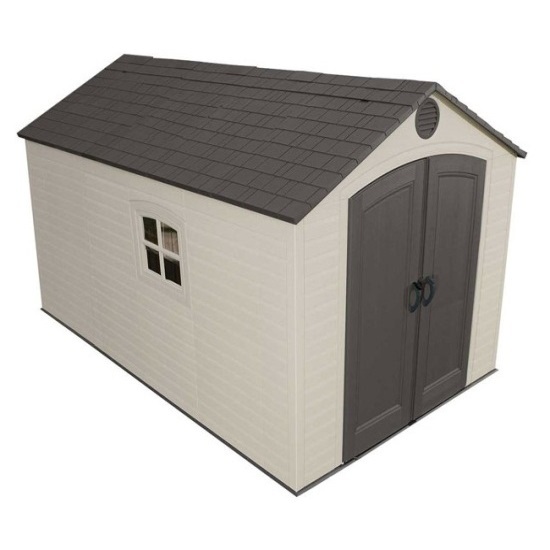 A: Lifetime, the manufacturer of this shed, only makes sheds that are the same color as the one shown in the picture. The color is light tan walls and a dark tan roof. I don't know of any sheds with the coloring that you requested, All of the white sheds will have a white roof. Q: What material is recommended for the Foundation? A: The manufacturer recommends placing the shed on a flat structure such as a wooden foundation made of treated 2x4's and OSB board that you can pick up from your local home improvement store. The instructions show just how to build it and what materials are needed. The other recommendation is a concrete slab. The concrete slab is more pricey to erect. Some customers put it on cynderblocks, pea gravel, or other flat structures. The important thing is to make sure it is flat and drains well. If it isn't flat you may run into issues with your doors closing properly. Feel free to contact us with any other questions. A: This shed must be built on a flat level foundation of wood or concrete. Q: Can I build this shed so that it is only 8' x 10' and just have extra pieces? A: That is not recommended because the structural bracing and roof panels may not line up. 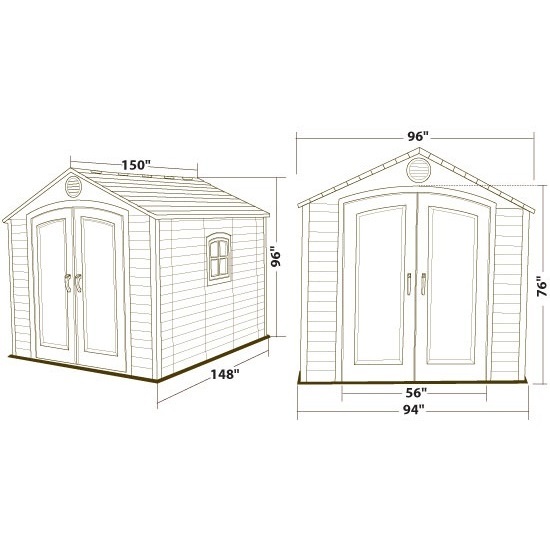 If you need a 8' 10' Shed, then the 6405 is very similar and is the size you are looking for. A: Yes, simply click on the "instructions" tab above our description. Feel free to contact us with any other questions. Q: Is there a floor in this building ? A: Yes, the lifetime sheds all include floors. You still need to build a wooden base or put it on concrete slab, but it does include the floor. Q: Is it okay to have this shed directly on the ground? If not, will just the gravel base suffice? Q: I would like to build the foundation for the 8 x 12.5 shed now. Can you e-mail me the blue prints? A: Simply click on the instructions link tab, below the pictures to the right, and it will give you the instructions for building the base. Feel free to contact us with any other questions. Q: does this product come in white? A: This does not come in any colors other than the color shown in the picture, which is desert tan and brown. Feel free to contact us with any other questions. Q: Are the metal parts Rust Resistant? How well will they stand up to coastal humidity and rain? A: The metal parts are not rust resistant per se. They have a powder coated finish to prevent rust, but eventually they will rust. Fortunately, the metal parts are on the interior of the shed. Also, there are replacement parts should any issues arise with rusting. Q: How Far From the Fence Line does the Assembly need to be? A: You need to be able to at least walk around the outside of the shed, but you will want much more clearance than that. Q: How Do I Get the Owners Manual for the Shed Model # 6402 8 X12 Shed? A: Please go to the following link: Http://Www.lifetime.com/Customerservice/Assemblyinstructions. Put your model # in the box and leave the product id blank. DO NOT choose a language and press the submit button. Scroll down the page and find the last instructions listed and you will then be able to download the instructions. If you need anything else please let us know. Q: What colors are available for this Shed? A: Currently we only have the one color option which is shown in the picture. 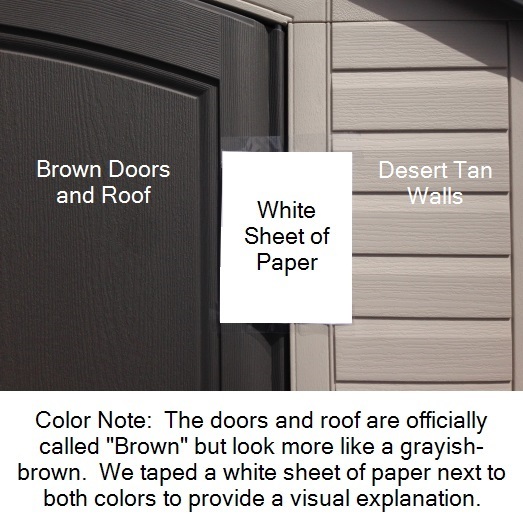 It is described as desert sand(tan) for the walls and dark brown for the roof and doors. Q: Do you do Installation for sheds, or do you have a handyman we can contact? A: We are not contracted with anyone to do assemblies. Our recommendation would be to call around your area to see if there is a handyman in your area that is familiar with our product. Q: How can I replace the corners of the shed if they become damaged? A: For replacement parts, please contact Customer Service at 1-800-225-3865 or e-mail at customercare@lifetime.com. Q: Can this shed be assembled so that both windows are on the same side? Are all Lifetime sheds made in the USA? A: Yes, both windows can be installed on the same side. 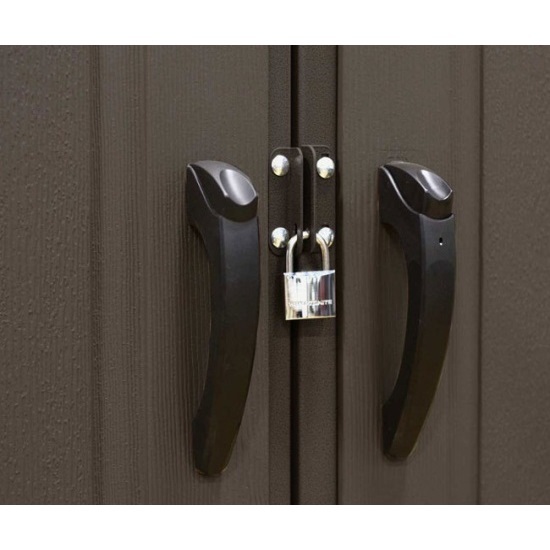 Lifetime Sheds are made in the USA, however we do have some products that are manufactured in a China facility. Q: Can parts be purchased separately such as the skylight, center roof cap, and truss gutter channel? A: To purchase replacement parts, please call Customer Service at 1-800-225-3865 or e-mail customercare@lifetime.com. Q: Is the 8 x 12 ft shed Portable? A: This shed is not intended for portable use. Q: Can I put a Window panel in the end wall of a 6402 shed? A: You can put a window panel in the end wall of the 6402. It should be show in the instructions how to slide it in. Q: What is the height of the door opening on this shed? A: The door height is 76"
Q: Do you sell any Brackets things to hold things like ladders off the floor? A: You could visit our assembly page, but other than that I would recommend calling around to find a handyman. A: Check Model 0113. Also, for replacement parts, please contact Customer Service at 1-800-225-3865 or email at Customercare@Lifetime.com. A: Yes, many of the wall panels are interchangeable, as long as they have the same dimensions and connection mechanisms. Q: Does this shed include a floor? A: All lifetime sheds Include a black floor with good traction with the shed. Q: Does this keep out all bugs and will it be able to withstand the weather? A: This shed is well sealed off from the elements and insects, but it is an outdoor structure and will probably eventually get some bugs. The shed is water resistant, but not water tight, it should keep out snow and rain, but it should not be considered completely waterproof. Q: would two of these be able to attach so I could have one twice as long? A: No, they wouldn't be able to attach. The problem is with the back wall. You would need to order a lot of different parts since the roof and wall and floor panels have receiving ends for the wall. They simply wouldn't fit together. There are extension kits available, however. The model numbers for the extension kits are 6422 and 6424. Q: Do the windows on the shed open up? A: One of the 2 windows does open up and it has a screen. Q: Can I assemble this in the quarter or next to a structure? Will I still have full access to be able to assemble it? A: Yes, you can absolutely assemble it next to a structure. The assembly is from the interior. Shipping: Orders for the 6402 Lifetime Storage Structure generally leave the warehouse the next business day. Shed model 6402 comes into boxes weighing a total of 598 pounds. Box number one is labeled 64020, 316 pounds, 96 x 32 x 14. Box number two is labeled 64021 and weighs 223 pounds, 75 x 32 x 14. Dimensions: 96" x 32" x 33"